*Notice: Starting in 2008, The Valassis ("V") packets now say "Redplum" on the front. A complete listing of all unexpired manufacturers coupons that have been distributed in your state. The code at the end of each entry means: The initials of which company printed that packet (RP=Redplum packet, SS=Smartsource packet and so on) followed by The date printed on the spine of that exact packet. If there is more than one packet from Smartsource, it is named more descriptively, (Sometimes a packet is simply named "General Mills" or "Kellogs"). The packets always have a date printed on the spine, writing it on the front can make it easier to file. Other codes: P&G ="p&g packet", DND =coupon says "do not double", FORM ="mail-in offer" Feel free to ask us ANY question! "SINGLES" printable manufacturers coupons. Constantly Updated. This is a data feed so it should be current. Your personal print limit is almost always 2 per coupon, per month. It "re-sets" at the beginning of the next month. Many of the "Allowance" coupons can re-appear, but some will be gone forever. Also, if a "1.00 off 1" coupon appears in Group A, and you see an Identical coupon in "SINGLES" or on pillsbury.com: It's the same coupon and your print limit is 2 total, not 2 from each site. The print software you installed tracks that for them! However, if the Group A coupon is "1.00 off 1" and the pillsbury.com coupon is ".75 off 1": It's 2 different coupons and you'll be able to print 2 of each. -Contact us if you need any clarification: Feel free to ask us ANY question. Ever notice how promotions at the grocery store feature a different "Parent" manufacturer each week? The section below explains which brands are owned by each "Parent" manufacturer. -Different coupons come and go. To avoid confusion, print these first, THEN try the other sites. -10-20 coupons. These sites mostly share the same coupons with each other. If you print it on Betty Crocker, it WILL NOT print again on Pillsbury! - 0 to 2 coupons. - 1 to 5 coupons. - 1 - 2 coupons. - 0 to 4 coupons. - 4 to 7 coupons. - 3 to 7 coupons. - 1 to 2 coupons. - 2 to 3 coupons found nowhere else ("uniques"). - 2 to 4 coupons. - 1 to 3 coupons. - 3 to 4 coupons. - 2 to 3 coupons. Are you maximizing your grocery dollar? Just type in your "Preferred" or "Fresh Values" number at Upromise. After that, you'll earn money each time you shop at Albertsons or Smiths. YOU NEVER HAVE TO GIVE UPROMISE ANY MONEY! Think about it: a few cents per item really adds up over 20 years of grocery shopping. click here to sign up your grocery loyalty numbers at Upromise. 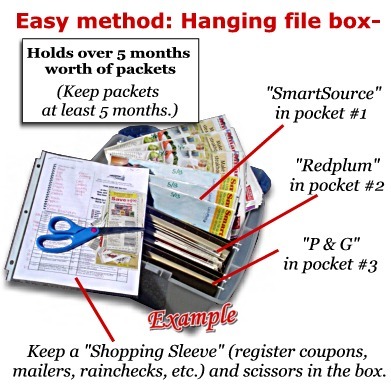 Filing coupon packets whole inside a hanging file box is the easiest way to be organized! Just use a few "large capacity" hanging file folders (2 or 3 inch "box-bottom" hanging files). Keep packets 5 months before discarding. When you want to use coupons, cut only the ones you are using for sure today, and leave the rest inside the box. When you head out to the store, just take the clipped coupons for your trip and your shopping list. The following is a schedule of what to expect each Week. -We provide these top notch savings classes as a FREE service; perfect for church groups, clubs, or even just a couple friends who want to learn. Just call to schedule, or use the form above to ask any question. Optional: If you want to distribute invitations for your class, click here (PDF file) to use ours, -or feel free to make up your own! How many Sunday newspapers should I be getting, to have enough coupons for stocking-up on grocery deals?